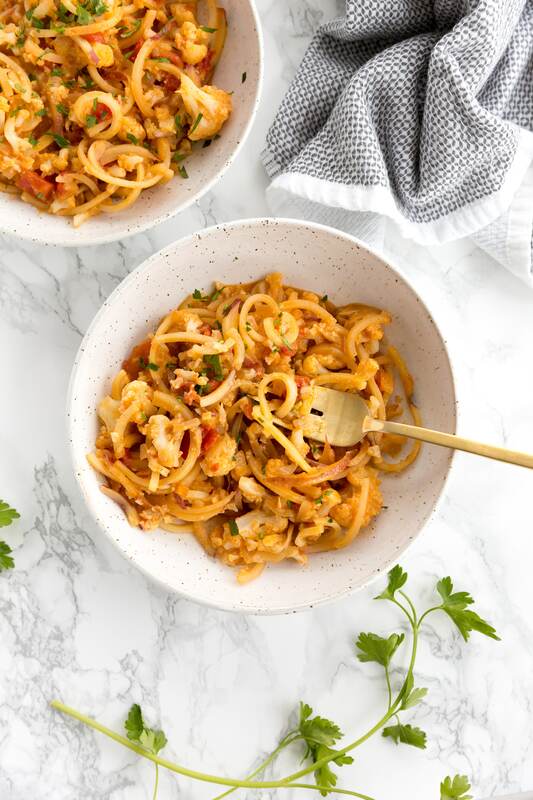 This spiralized version of vegan Aloo Gobi, an Indian dish made of cauliflower and potatoes is quick and easy, filled with aromatic spices, and looks like a noodle dish with the spiralized potatoes. Aloo gobi is a vegetarian dish from India that’s made with potatoes, cauliflower and Indian spices. When I order Indian takeout, I always get aloo gobi! It’s the perfect balance of light and hearty and it has just enough spice. 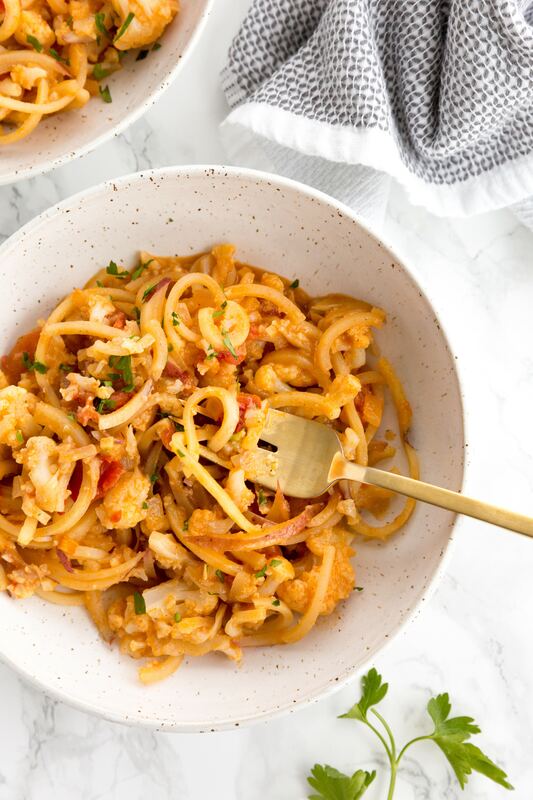 While the potatoes in the aloo gobi dish are typically cubed, this version uses spiralized potatoes, to transform this into a noodle-like dish. 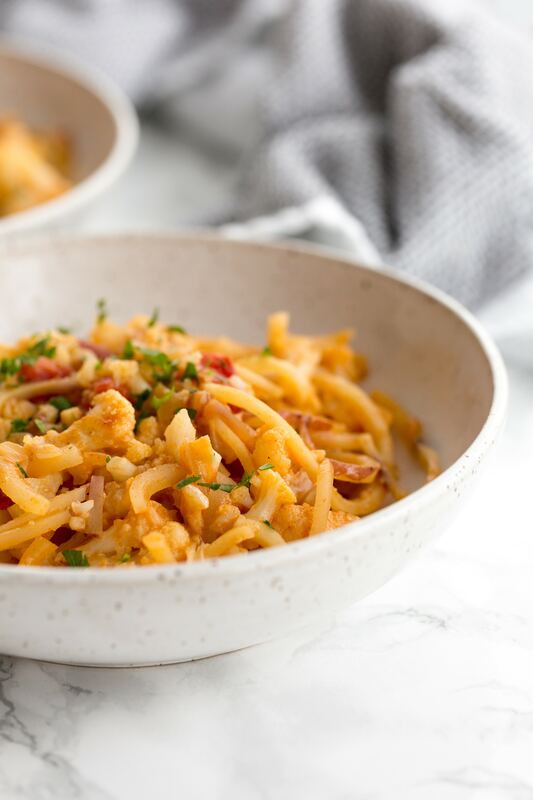 The spiralized potatoes ensure that you get a little bit of potato and cauliflower in every bite. The potatoes absorb the Indian spices, making for a robust and flavorful meal. By using spiralized potatoes, since they’re sliced more thinly than a cubed potato, the cook time reduces dramatically, so this version of aloo gobi is also quick and easy. I love stirring in lentils or chickpeas into this aloo gobi for some protein, to truly make it a complete meal. You could also serve this alongside some tandoori chicken or lamb, but this aloo gobi is vegan and gluten-free. Fill a large pot half-way with water and a pinch of salt and bring to a boil. Once boiling, add in the cauliflower and cook until slightly softened, but still firm, about 5 minutes. Drain into a colander and set aside. ?Back in the same pot, add in the olive oil and once heated, add in the onion, garlic and ginger and cook until onions are translucent, about 3-5 minutes.? ?Add in the tomatoes, chili, turmeric, garam masala, coriander and cumin. Stir well to combine and coat the tomatoes in the spices. Add the bay leaf, coconut cream, and broth. Stir well. Add in potatoes and cauliflower, season with salt and pepper, stir and cover, cooking for 10-15 minutes or until potato noodles are al dente or cooked to your preference. If you notice the water evaporating and you’d like more moisture, add a splash of broth. When done, remove bay leaf and divide the mixture into bowls and serve, garnished with parsley. Why do you always use red potatoes. Can you others? I've used other types of potatoes in my recipes, but red potatoes are easy to spiralize! Russet would work nicely here too! Thank you for the warm welcome, Cat! I haven't heard of 8 Owls Farmstead before but they sounds fantastic! I will definitely be looking into them. Thank you so much for the great suggestion. It's awesome to meet you! Thank you for the sweet welcome, Ruth. It's so great to meet you! I am really looking forward to getting to know this gorgeous community even better. Thank you for your awesome suggestions! This recipe looks fantastic! I haven't tried making cashew cream so I'm looking forward to trying this. This sounds amazing. Will save to try. We love all things Indian. Since our daughter (8 yrs now) was diagnosed with Celiac disease almost 2 yrs ago we have really expanded our recipe base and love to spiral veggies. She made sweet potatoes last night that she spiralized and sautéed in ghee. A friend is running the London Marathon in April and is earning money for her charity. We did a spring roll and maki roll class for about 10 kids as a fund raiser and we spiraled all the veggies that went in the rolls. The kids couldn't get enough. Two families eventually bought a spiralizer. Welcome aboard Meaghan! So glad you joined team Inspiralized, I am sure you will be a great help to Ali. Thanks, Aleesha! I am glad to be here! Everyone has been so welcoming. It's fantastic. This looks delish! I'm so happy for you to have help and I can't wait to see what you're coming up with next! Welcome Meaghan to inspiralized!! Excited to see what you both put out there. I did a tough mudder last year and would LOVE to do another!! Question - do you eat more "vegetarian" since your year as a vegetarian? Why did you go back? Hillary! Thank you for the awesome welcome. I am so looking forward to participating in a Tough Mudder! You're a total inspiration! I DO eat more vegetarian meals now that I went through the challenge. I found that I ended up trying a lot of cuisines that I would have normally passed up. It was a great experience but I went back because I missed seafood! I would make a great pescetarian. I just remembered that I hadn't preordered the cookbook, so I got on to Amazon quickly. It is great to have Meaghan with us, and it will be fun and interesting to see what happens with Inspiralized. I am thinking bigger and even better than it is. I do low carb and this blog has been very helpful with creative and delicious ideas. Thank you so much Ali for all the hard work and inspiration, and I am glad you found Meaghan. It's great to meet you, jamiemid! I am glad Ali found me too! I am thrilled to be a part of this awesome community! Welcome, Meaghan! Glad you're here to help out. I'm really looking forward to seeing the results of your work. Thank you so much, jesusan! You're so sweet. I am so happy to be here!! Welcome Meaghan! Love the Q&A getting to know you a little better. Thanks for the warm welcome, Adrienne! I had a lot of fun filling out the Q&A! I'm glad you enjoyed it. Welcome Meaghan! Can you use another low carb veggie in place of the potatoes for those that are Paleo? I was thinking Butternut Squash possibly? Yes, golden beets would work really nicely here! Aloo Gobi is one of my favorites. Can't wait to try this recipe! Welcome Meagan! I would also consider the great rutabagas here -- they add the noodle shape and a lovely yellow color plus very low in net carbs with the same amount of healthy fiber as both red and white or Russet potatoes which are both loaded with calories in the form of starch. So it just depends on what you're looking for and what you want to avoid. Thanks, Judith! It's great to be here!! Welcome to team Inspiralized Meaghan, I know we are all looking forward to getting to know you better. Ali, how lucky to have found such a nice young woman to help you! I say good for you and here's to the connection making life run a bit smoother for you. Marcia PS. The recipe looks yummy and I can hardly wait to try it! I was recently introduced to a spice by the name of Asafetida which, thanks to my niece, I learned it's magical and used a number of Indian dishes! She said it goes especially well with lentil dishes. I've used it a couple times and the depth of flavor it adds makes a real difference. Check it out! Thank you so much, Marcia! You're awesome. I am so happy to be a part of this Inspiralized family. Welcome Meaghan! Your assistance to Ali certainly verifies that Ali has built an empire! Good for you Ali! Welcome Meghan! I'm jealous of your cool job! Elena! Thanks for the welcome! You're the best. It's a true dream job. I am very lucky! Welcome to our Community Meghan. I am sure you are going to love it here....I know I do! I only just received my Spiralizer recently and I love it so much that it rarely leaves my kitchen bench. Every time I go to make a meal for myself...& start to consider what I can have....it ends up being something spiralized. So many options and so many wonderful recipes. I was eating the parsnip noodles with lemon, basil, cashew cream sauce with prawns the other night & between every 2nd mouthful I was saying to myself 'Yummm ...this is just so delicious!' I made it again the next day, but used zucchini noodles in place of the parsnips and it was just wonderful too! Spiralized vegetables are so filling, so tasty and so fast & easy to prepare. I can leave my meal preparation until just prior to dinner time & still only spend a few minutes to have it ready to serve. I look forward to learning more about you and hope that you really enjoy your position as Brand and Community Manager. Cheers from Down Under! Thank you for the warm welcome, Helen! I am the exact same way with my Spiralizer! It's an amazing tool! I have yet to meet a dish I didn't like. I am so excited to be here and learn more about you all!! Thank you for sharing! Thank you for the sweet welcome, Kelly! You're amazing. I am so happy to meet you all and to help Ali out! She is a true treasure. Welcome! Welcome! Meaghan!! I'm glad you are here to help Ali (not that she wasn't enough on her own). Looking forward to more inspiralized recipes!!! Welcome Meaghan and Congrats to Ali! I am also from MA and into healthy living/fitness and being Inspiralized. Looks like you two will make a great team - Rock On Ladies! Woo! MA!! Thanks for the welcome. You're awesome! Welcome Meaghan!! I looked around your blog and I will most certainly visit again. When I need a reminder to stay patient and on track. I just started spiralizing this week, so far so delicious! I look forward to "seeing you around." Have a great week! Pam! You're awesome. I am so glad you liked WellMiss and found a little inspiration! It's all about keeping it positive and loving life over here. I am so glad you're part of this community! Love the recipe. Welcome Meaghan. Nice to meet you. Nice to meet you too, MaryAnn! Thanks for the warm welcome! Are you supposed to just throw only the cashews into the blender? I would assume you're not supposed to add water because that would make cashew milk, but maybe I'm wrong? Any of your readers using a Vitamix as their high speed blender won't be able to make cashew cream with only 20 cashews... it is way too few for how the blades are positioned! Just wanted to bring that to your attention. Hello Meaghan! I grew up right across the river from Fall River, in Swansea, and I went to school in Fall River up until high school. It's not often I find someone else from this little corner! Welcome to the community, which I just joined myself! I'm loving it so far and I hope you are as well! Teresa! This basically makes us family! Haha! I love this. Thank you for reaching out. It so awesome to meet someone from Fall River. Small world! Welcome to the community too. I'm loving every minute of it! I am so glad you're here! This looks awesome. I'm wondering what specifics you'd recommend for freezing the dish. Should I make it all the way then cool and freeze? Thanks! Was wondering if you could use another nut besides cashews....like almonds? Can you prepare cashew paste in a food processor? If you can't have coconut (allergic, and it's now in everything! ), what could you substitute for the coconut cream? Thank you!! If you can eat dairy, I would substitute whole milk Greek yogurt for the coconut cream. It wouldn't be vegan, of course, but I think it would work. You wouldn't want to cook the yogurt, though, just stir it in at the end to warm it before serving. Great idea! Thank you so much Michele!